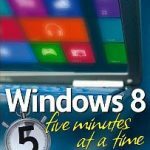 “Windows 8 Five Minutes at a Time,” $30 from Wiley.com, by Lance Whitney, has some great tips. 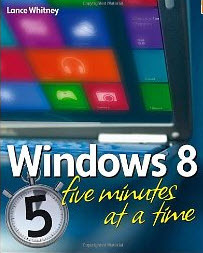 Each tip will take only five minutes to implement, and you get colorful screenshots to show you exactly what to do. For instance, you might want to use pictures instead of text for your passwords, customize the start screen so you see your favorite stocks updated regularly, keep everything backed up or print information from inside an app, such as the Travel app.